Smooth lakes, breathtaking redrock river canyons and exciting white water rapids are just a few of the things you’ll enjoy while canoeing and kayaking around Moab. The Green River is considered one of the premiere flat water paddling destinations in the country. 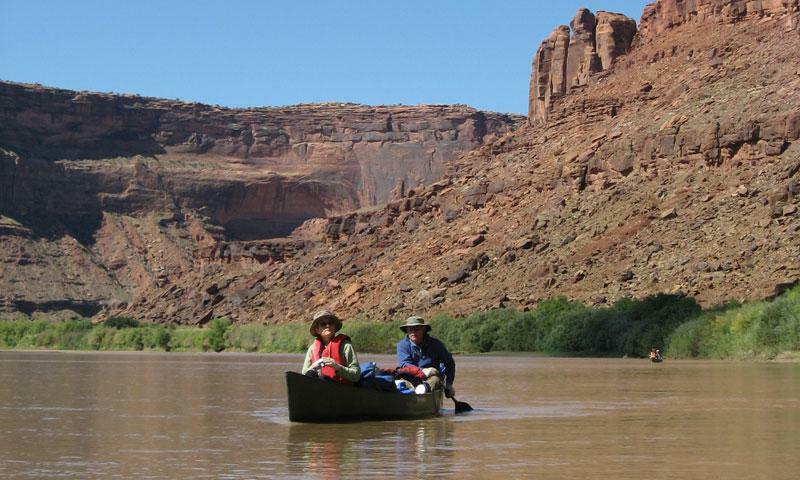 Canoeing and kayaking are a great way to explore Moab’s scenic area waterways. Permits are required for most floats. For more information call (435) 259-4351. The Colorado River has opportunities for both flat water and white water paddling. If you’re looking to get out on Moab’s area lakes and rivers, but want to be more nimble and independent than a rafting trip allows, consider heading out on a canoe or kayak. These smaller crafts generally hold one or two people, and allow for a degree of maneuverability and freedom not available on a large river raft. Whether you’re looking for a relaxing flat water paddle or an exciting white water trip, you can find in the waterways around Moab. Ken’s Lake, located just south of Moab outside of Spanish Valley, allows non motorized craft on the lake. The area has 31 campsites available on a first-come first-served basis so you can bring the boats and enjoy an overnight trip. Touted by many as the “premiere calm water canoe and sea kayak trip in America,” The Green River treats boaters to mile after mile of breathtaking smooth water paddling. Home to 52 miles of flat water, this trip's scenery is similar to Labyrinth Canyon, but also includes Crystal Geyser, one of the only cold water carbon dioxide driven geysers in the world. Combine with Labyrinth Canyon for 120 mile trip. This 51 mile section of river located just south of Moab is an ideal location for a trip in a sea kayak or canoe. Along the way you’ll enjoy views of Dead Horse Point, a towering cliff soaring approximately 1,800 feet above the river, ancient Anasazi ruins and rock art, as well as views of Canyonlands National Park. Beginning in town at the Moab Boat Ramp, this trip ranges in length from 11 – 17 miles, making this the perfect trip for a one day float. The take out is at Gold Bar Canyon for 11 miles, or Potash Boat Ramp for 17 miles. Along the way admire stone arches, massive cliff walls, and Anasazi rock art. When the Colorado is in its peak flow, Cataract Canyons 112 miles of white water are home to some of the most challenging rapids in the United States. Though most will take up to five days to complete the trip, it can be completed in just one. Permits are required for most trips. For more information call (435) 259-4351.